We present an analysis of the economic impacts of marketable permits for greenhouse gas reduction across industries and income groups in the United States. A computable general equilibrium model is used to simulate permit markets under various assumptions about permit allocations, industry coverage, revenue recycling, sequestration, and the inclusion of multiple greenhouse gases. Our results indicate that a permit price of as much as $128 per ton carbon would be needed to comply with the full U.S. Kyoto commitment, and that this would lead to a slightly more than I percent reduction in GDP in the year 2010. Expansion of trading to include carbon sequestration and methane mitigation can significantly lower these impacts. However, all policy alternatives simulated are somewhat regressive in terms of income distribution, though to significantly different degrees depending on the policy design. This paper estimates the effects on energy and oil demand of changes in income and oil prices, for 96 of the world's largest countries, in per-capita terms. We examine three important issues: the asymmetric effects on demand of increases and decreases in oil prices; the asymmetric effects on demand of increases and decreases in income; and the different speeds of demand adjustment to changes in price and in income. Our main conclusions are the following: (1) OECD demand responds much more to increases in oil prices than to decreases; ignoring this asymmetric price response will bias downward the estimated response to income changes; (2) demand's response to income decreases in many Non-OECD countries is not necessarily symmetric to its response to income increases; ignoring this asymmetric income response will bias the estimated response to income changes; (3) the speed of demand adjustment is faster to changes in income than to changes in price; ignoring this difference will bias upward the estimated response to income changes. Using correctly specified equations for energy and oil demand, the longrun response in demand for income growth is about 1.0 for Non-OECD Oil Exporters, Income Growers and perhaps all Non-OECD countries, and about 0.55 For OECD countries. These estimates for developing countries are significantly higher than current estimates used by the US Department of Energy. Our estimates for the OECD countries are also higher than those estimated recently by Schmalensee-Stoker-Judson (1998) and Holtz-Eakin and Selden (1995), who ignore the (asymmetric) effects of prices on demand. Higher responses to income changes, of course, will increase projections of energy and oil demand, and of carbon dioxide emissions. The Discovery Decline Phenomenon (DDP) requires that firm-level discoveries of a non-renewable resource depend, non-linearly, upon cumulative industry wide exploration. In this paper, an optimal rule for the exploration. effort that adheres to the DDP is derived. Data from the United Kingdom Continental Shelf (UKCS) are applied to the model where it is found that cumulative exploration is a highly significant determinant of firm-level exploration, and that prices and taxes also determine exploration effort. The 'Hubbert peak' in discoveries in the UKCS is estimated to be 1989 thereby improving upon previous estimates but also implying that the DDP in this region is already quite advanced. In the wake of the 1997 Kyoto Protocol, which if implemented would oblige industrialized countries to meet targets for greenhouse gases (GHGs) In 2008-2012, there have been several proposals to reduce emissions during the interim period. A concern for early reduction also arises in other policy contexts. This paper uses a series of simple models and numerical illustrations to analyze voluntary early reduction credits for GHGs. We examine several issues that affect the economic performance of these policies, including asymmetric information, learning-by-doing, and fiscal impacts, and we compare their performance with that of an early cap-and-trade program. We find that the economic benefits of early credit programs are likely to be limited, unless these credits can be banked to offset future emissions. Such banking was not allowed under the Kyoto Protocol. An early cap-and-trade program can avoid many of the problems of early credits, provided it does not require excessive abatement. This article compares the development of marginal cost pricing in the French and UK nationalised electricity industries between 1945 and 1970. Asking why French 'marginaliste' economists like Allais and Boiteux enjoyed more influence than their UK counterparts like Meade, political decisions concerning the organisation of the electricity industries, the differing influence of industrial and consumer interests, and the early postwar choices of hydro and thermal investment in France, are advanced as explanations. In the UK, the Treasury pushed nationalised industries towards marginal cost pricing, requiring them to earn rates of return on existing investment and to subject the proposed investment to test discount rates during the 1960s. 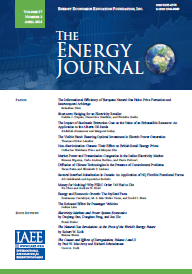 The paper closes by arguing that these different routes to marginal cost pricing in the French and UK nationalised electricity industries had significant effects on later government and public attitudes towards the privatisation and liberalisation of the national electricity industry and market. Atmospheric fluidized-bed combustion (AFBC) is the prevalent technology in boiler design for new power plants. Using plant-level cost data from a sample of commercial AFBC powerplants, we examine the effects of fuel type (scrap coal or standard-grade coal), plant size, and plant completion date on fuel costs, operating costs, capital costs, and levelized total costs per unit of electrical output. We find important relationships between the type of fuel used and unit-output fuel costs (AFBC plants burning scrap are cheaper in fuel per unit of output, despite the lower heat content of scrap) and between operating costs and plant size (larger AFBC plants are cheaper to run). While we find that the advantage in unit fuel costs is not reflected in levelized total costs (which are affected only by plant size), this result may be caused by our procedure for calculating levelized total costs from component costs.